I was sent the Milkshake CD — Got a Minute?, but was not compensated to write this post. The views expressed in this post are my own. Some links in this review are to my amazon affiliate account. When I was first blogging…back in the Dark Age of Blogging…2009…I was asked to review a CD for a band. The name of the band was VERY familiar to me. You see back way before the Dark Ages of Blogging. Yes, there did indeed exist a world before high speed internet and FIOS. I refer to this era as the Stone Age of the Internet. My children cannot imagine a world where you had intermittent internet and downloading a song or a file took forever. Back in those pioneer days in the early 2000s, I took my daughters to see a children’s band at a local library as part of an end-of-summer celebration. My girls LOVED Milkshake. They happily danced and sang. The energy of Milkshake’s Lisa Mathews and Mikel Gehl and their bandmates was infectious. I was soon dancing too! My daughters were 6 and 4. Milkshake was their first concert! The kids loved Milkshake so much that we drove home that day listening to the Happy Songs CD. That CD was a staple for years. Many a day I would pull out one of the Milkshake CDs to chase the blues away. I can sing some of their songs after only hearing one or two notes. Soon my girls moved on Disney and High School Musical CDs and whatever music they found on iTunes, but Milkshake was still a favorite in our house because of my youngest child. The beauty of Milkshake’s music is that it is timeless. Fun songs with catchy lyrics that are great for family sing-a-longs. When my youngest was about 6 we saw Milkshake live twice. The first time we caught a super cool live show taped at the Sirius FM Studios in D.C. Though my girls were a bit reluctant to go they enjoyed watching the process for taping a show that would later be broadcast. My son was fascinated that the drummer had his own private room. We could see him drumming, but his music was muted so that he wouldn’t overpower the rest of the band. Later that summer, my son and I caught ANOTHER Milkshake show…this time at a local shopping mall. We are definitely Milkshake groupies! I’m excited to let you know that Milkshake just released a new CD. Got a Minute? is the latest CD available for $14 at the MilkshakeMusic.com Store. We’ve listened to the CD quite a bit. Got a Minute? 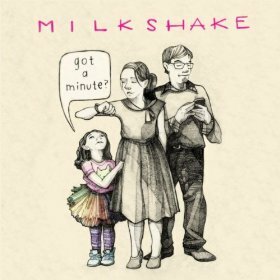 is Milkshake’s fifth CD for kids and was released in early 2013. Of the whopping 33 short songs on the CD: there are 13 songs that were written in 2006 for PBS KIDS, and 20 new ones. Most of the songs are under two minutes…perfect length to get your child up and moving and eager for the next song to come on. Got a Minute? — the title track — Click here to listen. You can purchase this new CD, other CDs, and related Milkshake Band merchandise (including balls, t-shirts, and tutus) on their website’s Store: MilkshakeBand.com. Or you can find Got a Minute? on amazon.com…on CD or on MP3.